The massive area of ice underwater, as seen in this aerial picture, acts like a sail as the iceberg is carried south on the cold Labrador currents and along the coast of Newfoundland on the Atlantic Ocean. This large tabular iceberg looks harmless enough as it cruises the Atlantic Ocean, but from this aerial photo it's easy to see where the phrase "tip of the iceberg" comes from. Because the density of pure ice is less compared to sea water, only approximately one tenth of an iceberg can be seen above the water, while the other nine tenths are concealed underwater. Often the base which is concealed underwater, fans out making it treacherous for shipping traffic as the iceberg is closer and larger than it appears. At any given time large sections of the iceberg can break off, which in turn changes its balance - sometimes causing it to flip over without warning. For this reason it is not recommended to get too close to an iceberg. 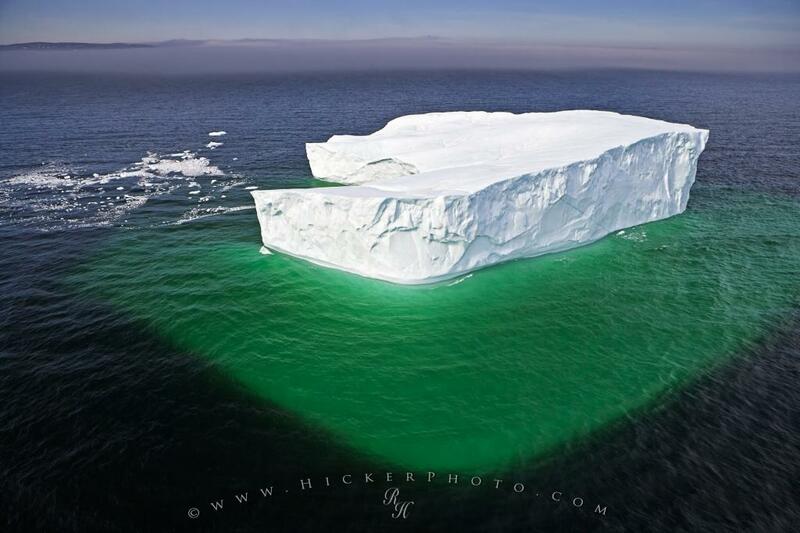 Aerial photo of the large underwater base of an iceberg in the Strait of Belle Isle (Atlantic Ocean), Labrador. Pictures from photo gallery "Iceberg Pictures"
This picture is part of the photo album "Iceberg Pictures" - there are more beautiful images waiting for you. ... boat is from St Anthony on the the Northern Peninsula of Newfoundland or alternatively, if you can talk a local pilot into it, get some great aerial pictures of icebergs during a sightseeing flight. Aerial picture of a large iceberg with its larger base hidden underwater in the Strait of Belle Isle (Atlantic Ocean), Southern Labrador, Labrador, Newfoundland Labrador, Canada. Please make sure to visit our special collection with more aerial pictures. I photographed this photo with the digital SLR camera model Canon EOS-1Ds Mark II, aperture of f/6.3, exposure time of 1/500 sec. on ISO 200, as always I used a original Canon Lens, the focus lenght for this picture was 24mm.